Like a Mount Shasta of Colorado, Mount Sopris rises dramatically from the Roaring Fork Valley floor, creating a looming, venerable presence in the wilderness north of Aspen. This formidable summit in the sky dominates the Carbondale, CO, vista. Fish to your heart's content at Dinkle and Thomas Lakes. Bike along Hay Park Trail for epic views of the mountain. At 12,965 feet, Mount Sopris does not hold the title of Colorado's highest peak, but it certainly presents itself as a formidable summit, dominating the vista views from Carbondale, CO. Mount Sopris, with an east and west summit, has become a rite of passage for mountaineers in the greater Aspen area. 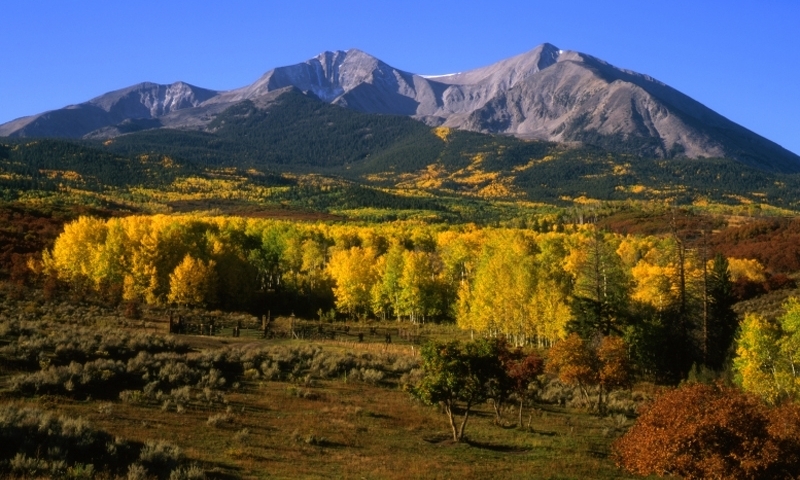 A forest ranger remarked that folks have moved to the area just to conquer Mount Sopris. Located west of Snowmass Village and south of Carbondale, recreation in the vicinity of Mount Sopris can be accessed by heading south on Highway 133 (at junction of CO-82 at Carbondale) about 1.5 miles, then left on Prince Creek Road. Biking and hiking access points can be found along this road. For updated information regarding trail maintenance and weather conditions, contact White River National Forest at the Sopris Ranger District by calling (970) 963-2266. The summer months of July and August propose your best bet for a safe summit of Mount Sopris. Hiking, biking and fishing can be enjoyed during the Spring, Summer and Fall. Any time of the year, however, be prepared for the worst of weather conditions, as a warm, sunny day in August can quickly become an afternoon of severe weather and freezing temperatures. Contact the ranger district for current information. Mount Sopris, in the Elk Range, stands within the designated Maroon Bells-Snowmass Wilderness in White River National Forest. For maps of the area, visit Aspen or Sopris Ranger Districts offices. Moderate and difficult biking routes can be found along Prince Creek Road. Porcupine and Crown Trails have access points on the eastern side of Prince Creek Road between miles 2 and 4. The most popular route, Hay Park Trail, can be accessed at Thomas Lakes Trailhead (see Hiking, below, for directions) or from the BLM parking lot found by driving 14 miles north of Aspen on Highway 82, taking Snowmass Creek Road south, then following Capitol Creek Road to a T, and heading right 2 miles on unpaved road to trailhead. Hay Park Trail runs 7.4 miles from end to end and carries a “Moderate” rating by White River National Forest standards. Access to Roaring Fork Valley's famous sportfishing can be found at Dinkle Lake, near Thomas Lakes Trailhead, and at Thomas Lakes, an easy 3 mile hike from trailhead. These lakes do not carry special conditions or restrictions beyond Colorado State licensing requirements. Fishing licenses can be purchased from Colorado Department of Wildlife by visiting www.wildlife.state.co.us or by calling 1-800-244-5613. Call Glenwood Springs office of Department of Wildlife for more information regarding access to the numerous creeks on the greater Wilderness and National Forest lands. Designated sites can be found at Thomas Lakes. No dogs are allowed. Avalanche Campground: Located southwest of Mount Sopris, this campground can be found by driving 14 miles south of Carbondale on Highway 133, then east about 2 miles down an access road adjacent to Avalanche Creek. Amenities include well water and two vault toilets, with fire ring and picnic table at each site. No reservations or electricity. While the campground does not provide trail access to Mount Sopris, Avalanche Creek Trailhead provides miles of hiking in the Maroon Bells-Snowmass Wilderness. Mount Timpanogos is a scenic cave and national monument in Utah's Wasatch Mountains.